The GI Joe 25th Anniversary Collection brought back a lot of what originally made the property successful in the first place: low prices, highly poseable figures, interesting characters and plenty of fun accessories. Now Generation 3 has brought back something else: the mailaway exclusive. Graduated from Harvard Medical School, completed residency at Johns Hopkins. Hoped for a guarantee of a GI Joe assignment upon enlistment. Told flatly that the Army made no such deals. Doc enlisted anyway and achieved his goal through ordinary channels. Graduated Airborne School, Mountaineering School, and Desert Training Unit. Since way back in the day, Doc has been an example of how inclusive and desegregated the Joe team was. No, not because he's black - don't be ridiculous! He was a year behind Stalker in the lineup, anyway. 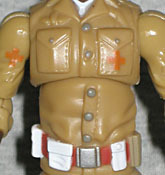 The reason it's strange to see Doc as a member of GI Joe is that he's an avowed pacifist. He's not afraid of a fight, he just knows that a battlefield medic has to be willing to treat anyone and respecting both the Geneva Convention and the Hippocratic Oath is key to having the freedom to do his work. 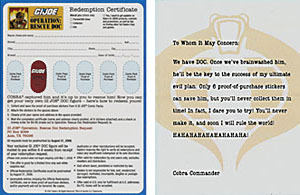 Doc was available as a mailaway promotion: "Operation: Rescue Doc" labels were included with the Generation 3 comic packs; collect six labels, send them in with four bucks for shipping and handling, then wait forever and they eventually send you your figure. It doesn't sound too bad, but you have to remember that the first few G3 comic packs were pretty well crap - it was a gamble to see if they'd release six good ones before the deadline for sending in the form. They barely made it, even being generous with some of the not-as-lame-as-the-rest sets. The figure shares the majority of his sculpt with Duke, which is fine: the same thing was true in Generation 1. He's got his sleeves rolled up, so he can get to work, and he's wearing sensible shoes: his feet and lower legs are (almost) the only bits not borrowed from Duke. One of the reasons Doc has always stood out from the crowd is his uniform. While everyone else was in some version of green or black (or green and black), Doc was wearing head-to-toe khaki. His yellowish tan uniform set him apart, making him look like part of a distinct unit; even across a battlefield, you'd be able to recognize him as medical corps. His belt is orange with white pouches all the way around, and he has orange crosses on his chest and right sleeve. Doc's head is new, since one of his defining features has always been that he wears green glasses, and neither Wild Bill nor Buzzer would work as the base for a repaint. His glasses actually look a bit small on his face, but that may simply be a result of the card artwork showing them so big. His hair actually looks like a black man's would and his skin, painted in all instances rather than cast in color, has a nice even tone. Doc has five accessories: two to wear, three to carry. 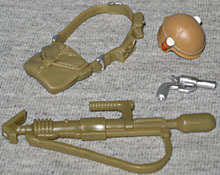 He has an update of his old helmet, with two pill bottles carried on the sides, and a unique satchel with pouches on the strap. This is obviously something designed specifically for Doc - it's not like anyone else would be lugging around a bag marked with the caduceus, right? Since the Geneva Convention says Doc can't fire a weapon, it was always odd that the 1983 figure had a gun holstered on his leg. This version corrects that not by removing the holster, but by changing what's in it: he now has a new silver flare gun. However, it's incredibly loose in the holster and will fall out easily, which is disappointing. He also has a mortar launcher - once again, probably for flares. His coolest accessory, though, is the 4⅞" long stretcher. 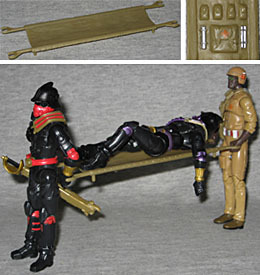 Sculpted to look like thick canvas held taut by two poles, the stretcher is big enough to accommodate any 3¾" scale figure, and has prongs on the ends that clip onto figures' wrists so they can "carry" the wounded. On the underside, you'll find four small pockets, a large pouch and some silver medical tools - this thing is a portable medical station! Despite being based on the Duke body, Doc doesn't quite share all the same articulation. He has the balljointed head, shoulders, elbows, torso, hips and ankles, and the double-hinged knees, but he doesn't have the swivels in the middle of his forearms. Oh, he still has the range of motion, the joints have just been moved up to the end of his sleeve, rather than cutting through the bare arm. It's a small change, but a nice one, and means there are two versions of Doc out there: early shipments had the old style forearms. Surprisingly, Doc is packaged on a full-sized card, not just sealed in a plastic bag and a white cardboard box. The card is also in one of those plastic clamshells Hasbro sells on their site; the same sort civilian Cobra Commander came in. The back has the filecard and images of other figures in the line - including two pictures of Destro. Somebody really likes Destro. Mailaway figures were a staple of the original Real American Hero line in the '80s, so Doc is an interesting throwback in that regard. Of course, the toys you had to buy to send away for him were either not worth buying or hard to find, so you kind of had to scramble, but despite that, Hasbro had to go back for a second production run to meet demands. The toy itself is good, and even rates pretty highly on our criteria for a perfect exclusive: he's somewhat of a fan-favorite, but not a must-have; he's a repaint, but has a lot of new stuff to offer; he might not sell too well on store shelves, but would definitely appeal to the people who already met the requirements to order him. If you sent away for Doc (sadly, the promotion has ended, so if you didn't do it by now, you're out of luck), you won't be disappointed when he finally, after a huge wait, arrives. If you couldn't convince yourself there were six comic packs worth buying, well, at least you don't have to find room for a bunch of bad repaints.